Ecovillages are intentional or traditional communities, consciously designed through participatory processes to regenerate their social and natural environments. The social, ecological, economic, and cultural aspects are integrated into a holistic sustainable development model that is adapted to local contexts. Ecovillages are rural or urban settlements with vibrant social structures, vastly diverse, yet united in their actions towards low-impact, high quality lifestyles. I was born into apartheid. The word itself comes from my first language, Afrikaans. It means “to set apart” or “to be in a state of separation.” In the South Africa of my childhood, people were set apart by the colors of their skin. And even though it was a country that was abundant with diverse cultures, I grew up in the incongruent monotony of an all-white neighborhood and an all-white school. It simply did not feel right. Even as a child, I started asking uncomfortable questions of my parents and teachers. As I came to realize the depth of injustice and pain the system inflicted, I became a very angry youth, and as a young adult, after moving to Amsterdam, I became an anti-apartheid activist. I studied cultural anthropology and linguistics in hope of learning how to bridge gaps through intercultural communication and help heal what was broken apart. Unfortunately, that is not what was taught at universities in the late 1980s. What I started to understand, though, and fully realized later, is that apartheid did not die in the early 1990s in South Africa. It was alive and kicking then and is alive and kicking today, being reinforced with every fence and every wall that is going up. On a global level, people’s access to healthcare and wealth, their level of education and their freedom of movement are all decisively influenced by the passport they carry. And, on a more fundamental level, as humans we have set ourselves apart from the natural world and other species that share the planet with us. The abolition of apartheid is still waiting for its fulfillment, even in South Africa. In order to acknowledge our oneness with all living systems and live accordingly, we need to have courage. We need to leave the highways that lull us into a false sense of security and start exploring some of the roads less traveled, both within and beyond ourselves. As Einstein said: “We can’t solve problems by using the same kind of thinking we used to create them.” We need to start thinking and seeing things afresh, experiencing and being in our bodies anew. Scientists posit that we are aware of only around five percent of the total information that flows through our nervous systems. We could know so much more. We could practice broadening our awareness. We could shift the habitual pathways we travel within our own nervous systems. If we take a moment now to focus on our breath, on the in- and out-flow of air, on the stillness that lies within this movement, and how it connects us to all living things around us, we can sense our awareness shifting into a more connected and spacious mode. In a similar way, we can change the well-trod avenues we follow in our everyday realities. This is a time to have courage and go to places we haven’t been to before, make connections we haven’t made before, and create new synapses, insights, and solutions. When I was 23 years old, in 1991, I walked a path less traveled. Nelson Mandela had just been released from prison. The transition was finally coming, but tension and violence were at an all time high in South Africa. I returned to my country on a pilgrimage, wanting to walk its land and finally visit all the places where I had not been allowed, or had not dared, to go before. I was told I would be raped, if not killed. Setting off on foot, on a journey of about 1,000 km, from Stilbaai, the site of all my childhood summer holidays, up the east coast to Port St Johns in the Transkei, I felt a mixture of fear and determination. For the sake of my own integrity and healing, I felt I had no choice but to do this. People were shocked and sometimes amused to meet a young, white, Afrikaans woman walking through townships and deserted stretches of wild nature, sleeping in the dunes, swimming through rivers. I lived off the food and water that was offered to me and encountered nature, animals, humans, and even God in a way that healed something deep inside of me. Finally, close to Port St Johns, I ran into a community where people of all skin colors were living, building huts, and tilling the land together, learning about each other’s cultures. They had found a niche, in one of the so-called “homelands,” to live their dream of the future. They were living their dream in the now; without fighting existing structures. Seeing this shifted something deep inside of me. I realized I could invest my energy in more effective ways than through protest. Since then, I have sought to be part of building the new instead of fighting the old. This small community around Port St Johns became my entrance point into the Global Ecovillage Network (GEN)—a worldwide web of seeded dreams and roads less traveled. I started visiting communities around the globe, following an inner red thread of nomadic movement signposted by word of mouth recommendations that led me from one ecovillage to the next. I became witness to an emergence of a new culture rising slowly through communities around the planet where people came together to manifest their vision for the future. Each of these communities is, in their own way, bridging the gaps created by apartheid, healing relationships with the living systems of which they are a part. People are understanding that if we don’t wake up and consciously design our own future, past and present realities will surely shape it for us. And in that process we might lose so much that is precious. In intentional and traditional, rural and urban ecovillage projects, people choose to reconnect to nature, to each other, to the past and the future. They choose consciously to create solidarity and prepare the ground in respect for future generations. After celebrating the 20th anniversary of the Global Ecovillage Network in 2015, today we reach out to around 10,000 such communities all over the globe. Each of them is a local expression of the same universal exploration: how can we become true to our potential as humans? How can we heal apartheid, the separation within us, between us, and connecting us to the natural world? How can we honor life as a whole, rebuilding the connections that have been broken in the social, cultural, economic, and ecological areas of life? And in this process, these communities learn and demonstrate that, not only is there no need for us to destroy life, not only can we sustain life, but we can actually regenerate life around us if only we set our minds and hearts to it. We can tap into our intelligence and wisdom and find the solutions needed. We can regenerate the humus and the soils around us, composting and sequestering carbon through biochar, working hand in hand with microorganisms and the cycles of life. We can replenish the water tables that we have depleted in so many places. We can channel each precious drop of rainwater into catchment systems, swales, and water retention landscapes, supporting the much needed moisture to enter our soil instead of running over it, causing erosion. We can learn from nature and set up systems that produce no waste and use minimum effort for maximum effect, systems where each element fulfills multiple functions and is strengthened, through multiple connections, to become much more resilient. We can learn how energy runs through sunlight, winds, water flows, geothermal heat, and biomass, and we can find abundant sources for our energy needs, transitioning to 100 percent renewables in the coming decades. We can replant the forests that are the very lungs of this planet. We can grow our food in ways that support life. While even one child still goes to bed hungry, alone, and afraid, our work will not be completed. We can reconnect to our love for place, and respect for heritage, as a source of inner power. We can solve our conflicts and integrate our traumas. We can combine the best of our traditions with the most innovative solutions and ingenious updates that technology has to offer. We can find ways to marry our love for the planet with our need to make a living and rebuild economies that serve life instead of profit. We can do all that. Communities around the planet are playing their part on the frontlines of implementation right now. But we can only do this when we come together, letting go of our fears that there is not enough, and instead rebuilding cultures of sharing and solidarity. Generosity creates abundance. Ecovillages have been finding local solutions to global challenges. In ecovillages, we have developed lifestyles that are fulfilling and meaningful, while at the same time allowing us to tread softly on the earth. When I started out on my journey in 1991, ecovillages were hidden right at the very end of all those roads less traveled. In the past 25 years, ecovillages and the ecovillage way of life have started rising to the surface of mainstream culture. In some countries, ecovillage strategies have actually broken through the surface into visibility—leading to top-down support for bottom-up community-led approaches to sustainability. 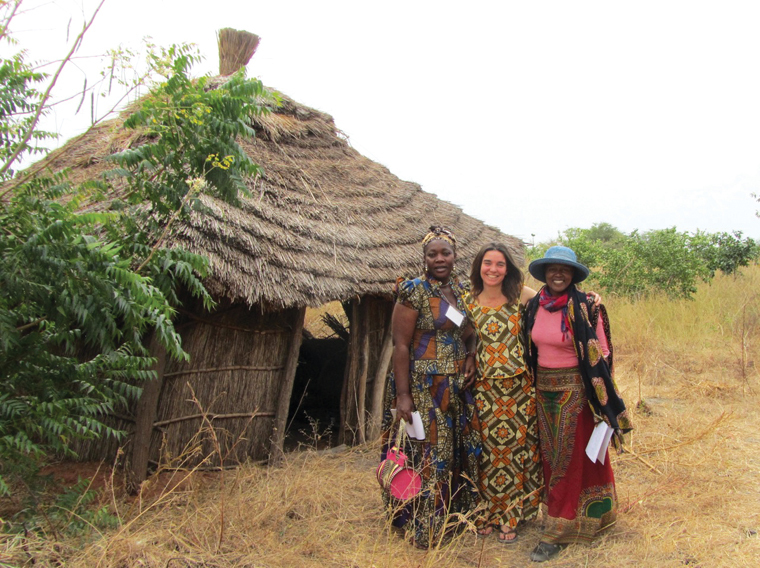 In Senegal, the government has seen how such communities can bring about positive change and have established an ecovillage program with the goal of transitioning 14,000 villages to ecovillages. In the Gambia, a bioregion of 13 villages is following this example. In Tanzania, the government has started with three pilot ecovillages and is now expanding the approach. In Thailand, Myanmar, Bangladesh, and India, we see community-led networks of change emerging from a similar impulse. The UN Sustainable Development Goals aim to make cities and human settlements inclusive, safe, resilient, and sustainable by 2030. Within GEN, we have been saying that, in effect, every village needs to become an ecovillage and every city a green city in order to support life to thrive around the world. The question of how the ecovillage approach can dramatically be scaled up, without losing its core value of locally owned, participatory processes, has become central. I believe that we can create a world that is at peace with itself. A world that lives within its own means. That we are able to come home to this planet, abolishing apartheid and stepping into right relationship with everything around, understanding that we can be caretakers, guardians, and lovers of life while we are here. So let me ask you: what are the roads less traveled in your life? What are those dreams and visions that are calling you to change your habits? Where are you are invited to expand and what gaps will you close by traveling into unfamiliar territory? Who are the people you know that you need to have a conversation with, that you need to listen to, whom you have been avoiding? Maybe you feel interested in exploring your own cultural roots and coming into alignment with your higher purpose? Would you like to explore the ecology of your everyday life more deeply? Do you know where your food, your water, your energy comes from? Which ecosystems in your environment could you enrich through simple action? Maybe it’s the windowsill in your kitchen or the space around a tree in front of your house? How do you aim to change the economy of your life in order to focus on sharing and not only your own personal profit? And who is part of the network of friends that you want to create the future with? Another world is not only possible. She is on her way. On quiet days I can hear her breathing. Kosha Joubert serves as Executive Director of GEN International, and sits on the Advisory Board of GEN Africa. She has many years of experience as an international facilitator, trainer, and consultant and has worked extensively in the fields of curriculum development, international collaboration, and sustainable development. Kosha grew up in South Africa under apartheid and has been dedicated to building bridges across all divides ever since. She has lived in ecovillages for the past 25 years and been a driving force in GEN for eight years. Kosha is also a cofounder of Gaia Education, which develops trainings at the cutting-edge of sustainability, and coauthor of the internationally applied Gaia Education curriculum, the Ecovillage Design Education. You can see her TEDx Talk on Ecovillages here: youtu.be/gGbuOBCGfmQ.